How and why I came to adopt a grave. 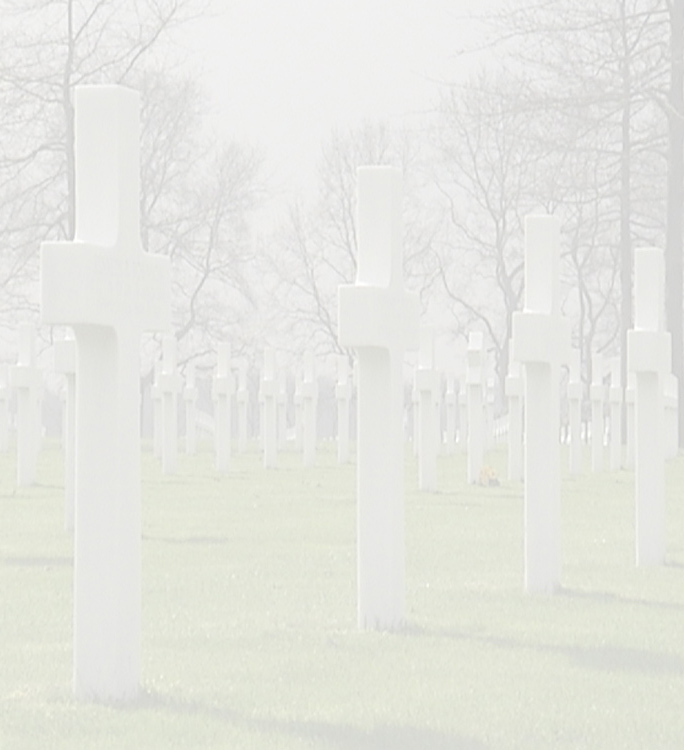 I grew up with the feeling that the American cemetery is a special place here in the south of Limburg. With the school in Margraten, named after major-general Maurice B. Rose we’ve often visited the cemetery. But also on my own I often visited the cemetery, it gives me a special feeling every time again to wander between the crosses and enjoy the tranquillity and atmosphere going with the cemetery. It gives a special feeling. My interest for the 2nd World War also started at a young age. I could look in books on the war for hours. Look at pictures and read the stories. I also watched documentaries on tv and still do. Some years ago I started collecting US memorials from the 2nd World Ward. What also fascinated me were the stories told by older people, grandparents and other elderly friends. I always tried to imagine who things would have looked during the years of war and the liberated years after. 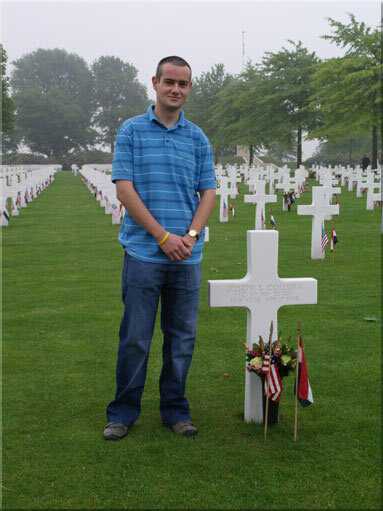 My grandparents live close to the American cemetery in Honthem. They well remembered how the arising of the cemetery started. Those were horrible pictures. A couple of years ago my sister and I decided to adopt a grave. We often visited the site but by adopting one got a special bound. The adoption of a grave to me personally means a sign of gratitude to the soldiers who gave their lives for the liberation of Europe. Most soldiers were of my age, around 22, and often younger. Which left safe surroundings in America to fight in unknown surroundings against Nazi Germany. I’ve made a phone request to the committee Adoption Graves to adopt one. The grave of plot J, row 5, grave 13 Pfc Joseph S. Collura serial number 328337187 was appointed to me. Pfc Joseph S. Collura served in the 199th infantry regiment of the 30th division Old Hickory. This division participated in the liberation of Southern Limburg. I’ve applied for the IDPF file. Pfc Joseph S. Collura was born on May 14th 1924, probably in the county Erie Buffalo New York. He took active duty on February 16th 1943. According the 1st Battle Casualty report of October 26th 1944 Pfc Joseph S. Collura went MIA (missing in action) in Germany since October 6th. A 2nd Battle Casualty reported that the date of death was October 13th in Germany, cause of death was RTD (I don’t know what that means). In a death report of May 18th 1945 as cause of death KIA (killed in action) is mentioned and the official date of his death is set on April 17 1945. This is also mentioned on the headstone. His dads’ name was Benny Collura and he lived at 276 Busti Avenue Buffalo New York. From the information out of the IDPF file his dads’ first choice was that the body of his son was reinterned to America. He deleted this request later and choose that his son was interred in the permanent cemetery in Margraten Holland. I’ve tried to find more information. Sometimes I don’t know where to start on the internet. I would like to have more information on Pfc Joseph S. Collura, a picture would be nice. And to find out of there is any family still alive. To let them know that regularly flowers are laid on the grave of Pfc Joseph S. Collura. A special occasion was the visit of president George W. Bush in Margraten on May 8th 2005. The visit was special because it was the first president bringing his respects to the killed soldiers buried in Margraten. This is a once of a life time experience.